Check the pH level of the soil at the planting site. Optimal pH for cherry trees is between 6.2 and 6.8. Lime can be added to lower pH while sulfur is used to raise it. Contact your local Oklahoma State University county extension office for help with soil testing and how to correct your pH level. Make your planting hole twice the width of the root ball or container. Dig the hole deep enough so that the base of the tree trunk will be an inch or two above grade after planting. Give the tree an inch or two of water when planted and water frequently, especially during hot weather. Cover the area around the tree with 4 to 6 inches of mulch such as wood chips or shredded bark. This is especially important if you have clay soil as the mulch is an effective way to change the soil to loam. Do not let the mulch touch the trunk to avoid rot problems. Prune the cherry tree in the fall by removing dead wood and thinning out central branches to allow light into the interior. 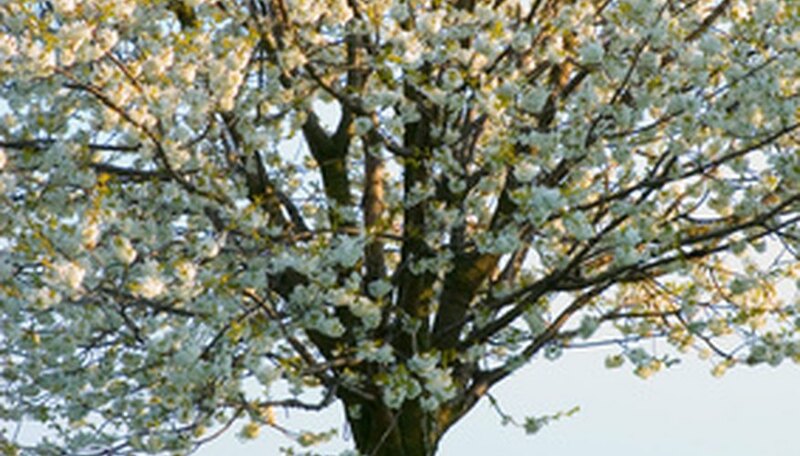 Choosing fertilizer for the tree will depends on your soil conditions. Consult your county extension office for advice based on the results of your soil test. Take into consideration how close the tree will be to buildings, power lines and neighboring properties when planting. Multiple trees should be planted at least 20 feet apart. Call Oklahoma One-Call at least 48 hours before you dig to locate underground services that may interfere with the planting site.